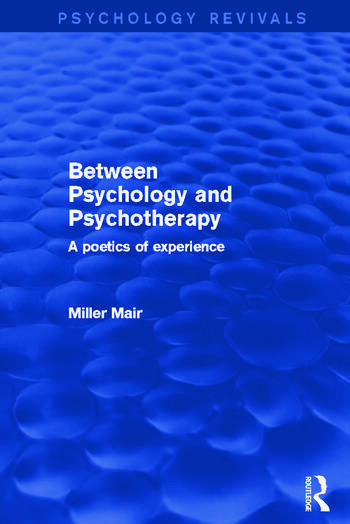 In this highly original and thought-provoking work the late Miller Mair puts forward his ideas for a new psychology. First published in 1989, he deals with issues of fundamental importance to the future of a psychology guided by genuine enquiry and concern rather than mere professional self-interest. Crossing and re-crossing boundaries between psychology, psychotherapy and philosophy, and between ‘science’ and ‘art’, he demonstrates the linkages between the personal and the impersonal, subject and object, inside and outside, with a daring not previously risked by anyone working in the area. Dr Mair stresses the importance of a poetic approach in psychology and psychotherapy, and the need to explore and understand the nature of psychology through an imaginative freedom of language. He emphasizes that a poetic awareness and attentiveness is fundamental to any pursuit of understanding of ourselves or others. This is a very personal book, concerned with personal knowledge, but it is meant for anyone who seeks to understand themselves and others, and what is involved in coming to such understanding. Focusing on ordinary human experience, and moving towards literary and artistic modes of expression, the author invites you to enter in, follow what you think and feel, as he proposes a radical revision of much that is accepted in psychology and in psychotherapy.